Trick or treating is the most important part of Halloween! He'll want fun and spacious Personalized Trick-Or-Treat Bags with which to collect his favorite candies. Our skeleton trick or treat bag is the perfect choice. This black canvas trick or treat back measures 16" H X 15" W and is personalized with any name for free! my grandson received this bag. according to him it's ok. who would of thought!!!!! I am very happy with this trick or treat bag! It is super cute and good quality. My son is 2 years old and I am confident it should last for all of his Halloweens to come and throughout his trick or treating career! Additional Details Dance with the ghouls and goblins this Halloween during trick or treating with our festive personalized treat bag! 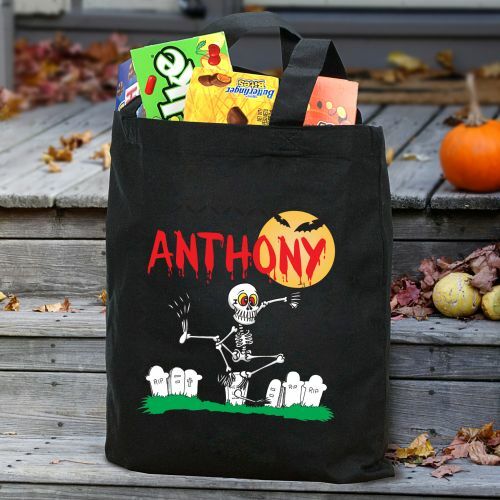 Your boys will be happy to fill these large treat bags to the top with their favorite candies and snacks this Halloween.